A lawsuit normally takes about two years to be resolved from the time it is initially filed with the court until the judge or jury gives a final verdict. However, there are times where a party cannot wait for two years for the situation to be resolved because the party is experiencing immediate and ongoing harm—the continuing damage for the next two years while the party waits for the trial to occur may shut down the company owned by the party. In situations like this where one party may suffer irreversible damage while the case slowly proceeds through litigation, the party can request a temporary restraining order (TRO) or preliminary injunction to stop the other side from causing harm while waiting for a resolution. The TRO and preliminary injunction are mechanisms that allow business owners to get the help and relief they need immediately, rather than waiting for the final verdict. A TRO is typically issued in circumstances where immediate action is necessary and sometimes even before the other party has a chance to respond. A preliminary injunction is issued after a hearing, similar to a mini-trial, where both parties argue the merits of the injunction. TROs and preliminary injunctions basically condense the two year trial process into one month, and a judge will analyze the facts presented and decide if one party should be forced to refrain from specific actions until a final verdict is given on the case. The burden to obtain a TRO or preliminary injunction is quite high; judges do not approve them lightly and certainly will not do so just because it is asked for. However, when one is granted, it can be a sign of how the court will rule in its final decision and provide huge benefits leading up to the decision. A common circumstance where a party may request a TRO or preliminary injunction includes the situation where a competitor steals confidential and proprietary information from a rival business and uses that information to steal clients and start a competing business. Without a TRO or preliminary injunction in place, the thieving business can continue to use that information and steal clients and potentially put the competitor out of business, or at least continue causing great harm, during the two years it takes to get to a trial. In such a situation, the business cannot wait two years to stop the theft of clients. It needs relief immediately. Thus, a judge may grant a TRO or preliminary injunction to stop the business from using the information and stealing clients. Obtaining a TRO or preliminary injunction is a complex process because of the specific procedural rules that must be followed to obtain one, and they are not easy to obtain because of the high burden of proof placed on the person seeking the injunction. Judges do not grant the injunctions lightly. It is a very fact intensive hearing based on the evidence both parties can submit. 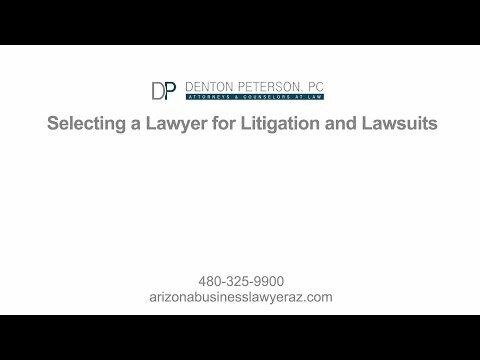 The experienced Arizona business attorneys at Denton Peterson, P.C. can help you navigate the procedures to help you obtain or defend yourself from a TRO or preliminary injunction. 1) There is no other remedy adequate for the situation and the harm suffered is truly irreparable. The party seeking the TRO/preliminary injunction must establish that the damage it will sustain is something that cannot simply be paid for with money. A judge will consider how likely it is that the alleged injuries will occur. Also, the judge will look at the type of harm and determine if it is actually irreparable. Even if the injuries are likely to occur, if they can simply be fixed with money damages, a judge may decide that a TRO or preliminary injunction is not warranted. In our example above, where one company is stealing confidential information and business clients, the judge is likely to determine that the clients and confidential information cannot be replaced with money. If, on the other hand, the business competitor stole office furniture and materials, the court is likely to determine that those damages can likely be fixed (or rectified) through money damages—i.e., the value of the office furniture (assuming the office furniture is not unique and specifically required to run the business for the next two years). 2) You must be substantially likely to win the case. A judge will not grant a TRO or preliminary injunction unless he believes the side seeking the injunction is likely to win the case. No judge will require the outcome to be certain, but he must see a serious lawsuit. If the case looks frivolous, the judge will never grant an injunction. Some judges may require a case to be more certain than others. It is very important that you hire a lawyer who can gather evidence quickly and is experienced with the procedures, because the process moves so much faster than a trial. You need a skilled attorney who will lay out the facts in convincing fashion to persuade the judge you are likely to win the case. 3) The benefit to the party seeking a TRO should be greater than the burden of the other party. A judge will essentially weigh the harm posed to the party seeking the injunction against the harm the injunction may cause the party it is placed on. For example, if the party seeking an injunction will go out of business without the injunction, and the other party will have less customers because it can no longer use allegedly stolen information, this factor would probably weigh in favor of the party seeking the injunction. At Denton Peterson, P.C. we have also represented clients who have been sued and had to defend themselves from a TRO or preliminary injunction. The process is basically the same, but in reverse. You have to gather your evidence quickly and argue that (1) the damage is not irreparable or that it can be remedied through money damages; (2) the other side is not substantially likely to win the case; and, (3) the injunction will hurt you more than it will help the other side who is asking for it. You do not have the burden of proof, so if you cast enough doubt on the three elements, the judge is not likely to grant the injunction. TROs and preliminary injunctions are powerful tools that can have dramatic consequences for the parties involved. There are also many tactical reasons to apply for TROs or preliminary injunctions that go beyond getting the order and look to the final outcome of the lawsuit. Filing for an injunction can force the other side to give up much of its evidence or admit fault in certain areas. Anyone who is seeking an injunction or defending against one should hire a litigation lawyer who is experienced with the intricacies and specific procedures of TROs and preliminary injunctions. You’ve been served (or have served someone) with a temporary restraining order…what next? You may have heard the phrase “temporary restraining order” floating around in the news lately. Jennifer Williams was just granted one against “Sweetie Pies” star Tim Norman; Dallas Cowboys running back Ezekiel Elliot was granted one last football season; and, Legoland opponents were granted a temporary restraining order last month, halting a project that involved a 500-acre tree clearing. Restraining orders are commonly associated with domestic violence, but did you know that they can be critical to the success of your business as well? Obtaining a temporary restraining order is frequently the first step taken by a business in an emergency litigation situation– i.e., where a business needs the court to take some temporary action right now, instead of waiting months or even years for a trial to occur. Temporary restraining orders are short-term pre-trial temporary injunctions 1 . A request for a temporary restraining order may be part of the initial pleadings in a lawsuit, and you want to make sure you hire an experienced attorney to walk you through the complicated process. The issuance of such orders is often necessary early in a lawsuit to stop someone or some entity from continuing their allegedly harmful actions until the court takes further actions, usually in the form of a court hearing, based on established facts. How can a temporary restraining order help your business? As a business owner, you have probably spent years establishing a good reputation with the community. Even though business reputations take countless hours to build, they can be ruined in just days by departing employees and competitors who spread false information or engage in some other kind of damaging conduct, such as disseminating crucial intellectual property or otherwise sensitive information to competitors or the general public. When these things happen, your business needs immediate help. Unfortunately, the usual pathway through the legal system is often too slow and will not work fast enough to protect your business’ reputation or sensitive information. Also, if you delay taking remedial actions, the worst damage may already be done before you have an opportunity to present your case to a judge. In short, a judge can do little to help your business if your reputation has already been destroyed or your sensitive information shared. When such conduct occurs, temporary restraining orders can prevent the defendant from engaging further in the damaging acts that harm your business until the court can make a more permanent ruling on it at a restraining order hearing, where both sides will be able to present their cases to the judge. What is a restraining order hearing? Because temporary restraining orders are “temporary”, they are sometimes granted ex parte (out of court), sometimes without the opportunity for rebuttal or even notice of the other party. Because the Judge may have based this decision to grant the temporary restraining order on arguments from only one side, it is usually necessary to hear the facts from the opposing party shortly thereafter. The purpose of the hearing is to decide whether or not your temporary restraining order will remain in effect (i.e., become more permanent), and if it does remain in effect, the court has to determine if the order will stay the same or be modified in some way. If the opposing party disagrees with the restraining order placed on them, this meeting provides them the opportunity to present the facts from their perspective and contest the order. At the hearing, the Judge will likely ask both parties to explain what happened and why the restraining order is or is not necessary. After hearing both sides, the Judge will then make a decision on whether to extend the length of the temporary restraining order (usually in the form of a preliminary injunction) or to deny extension based on the circumstances. Restraining order hearings can be complicated and much is at stake. Before representing yourself, you should make every effort to get help from an attorney. Granting the temporary restraining order is not against the best interest of the public. Additionally, your attorney must certify in writing any efforts made to give notice to the opposing party or the reasons why such notice should not be required. 2 Obtaining a temporary restraining order is not easy and not always necessary. If you think you or your business is in need of one, it is in your best interest to seek help from a legal professional. 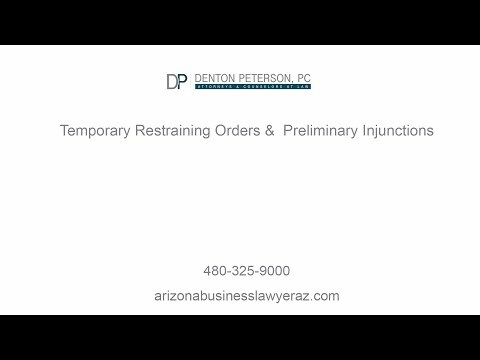 How long does a temporary restraining order last in Arizona? Temporary restraining orders are just that, temporary. Generally, temporary restraining orders will expire on the date set by the court. Such date should not exceed 10 days unless the court has good cause for an extension or where the opposing party consents to the extension. What can I do to prepare for the restraining order hearing? Before the restraining order hearing begins, try to think of all the arguments the opposing party will bring up, even if the arguments are not true. If you are prepared to address all the issues, then you will know what to expect and be capable of confidently explaining them to the Judge. Next, gather evidence. A judge will rule on evidence in a restraining order hearing the same way he does at trial. An experienced attorney can help you decide which evidence is admissible and which evidence is not. While you are at the hearing, speak only to the Judge because the opposing party might try to illicit certain responses from you to help their case. In any case, hire an attorney to maximize your potential for a successful outcome.